Consider the equilibrium configuration of a self-gravitating celestial body, composed of incompressible fluid, that is rotating steadily and uniformly about some fixed axis passing through its center of mass. Let us assume that the outer boundary of the body is spheroidal. (See Section 3.6.) Let be the body's total mass, its mean radius, its ellipticity, and its angular rotation velocity. Suppose, finally, that the body's axis of rotation coincides with its axis of symmetry, which is assumed to run along the -axis. 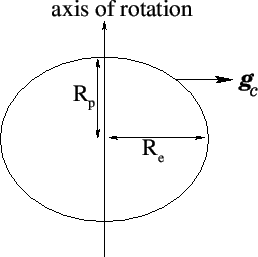 is the typical ratio of the centrifugal acceleration to the gravitational acceleration at . Let us assume that this ratio is small; that is, . We conclude, from the preceding expression, that the equilibrium configuration of a (relatively slowly) rotating self-gravitating fluid mass is an oblate spheroid--a sphere that is slightly flattened along its axis of rotation. The degree of flattening is proportional to the square of the rotation rate. The result of Equation (6.44) was derived on the assumption that there is zero shear stress at the surface of a uniform-density, rotating, self-gravitating, celestial body. This is certainly true for a fluid body, because fluids (by definition) are unable to withstand shear stresses. Solids, on the other hand, can withstand such stresses to a limited extent. Hence, it is not necessarily true that there is zero shear stress at the surface of a solid rotating body, such as the Earth. Let us investigate whether expression (6.44) needs to be modified for such a body. Thus, if then the rotational flattening of a uniform body made up of such rock is governed by Equation (6.49), but if then the flattening is governed by Equation (6.51). In fact, the observed degree of rotational flattening of the Earth is (Yoder 1995), corresponding to a difference between equatorial and polar radii of . Our analysis has overestimated the Earth's rotational flattening because, for the sake of simplicity, we assumed that the terrestrial interior is of uniform density. In reality, the Earth's core is significantly denser than its crust. (See Section D.6.) Incidentally, the observed value of the parameter , which measures the strength of the Earth's quadrupole gravitational field, is (Yoder 1995). Hence, . In other words, the Earth's rotational flattening satisfies Equation (6.43) extremely accurately. This confirms that although the Earth is not a uniform-density body its response to the centrifugal potential is indeed fluid-like [because Equation (6.43) was derived on the assumption that the surface of the rotating body in question is in hydrostatic equilibrium in the co-rotating frame]. 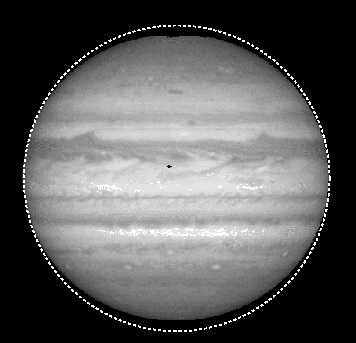 Figure: Jupiter. Photograph taken by Hubble Space Telescope. A circle is superimposed on the image to make the rotational flattening more clearly visible. The axis of rotation is vertical. Credit: NASA. This degree of flattening is much larger than that of the Earth, owing to Jupiter's relatively large radius (about ten times that of Earth), combined with its relatively short rotation period (about 0.4 days). In fact, the rotational flattening of Jupiter is clearly apparent from images of this planet. (See Figure 6.5.) The observed degree of rotational flattening of Jupiter is actually (Yoder 1995). Our estimate for is slightly too large because Jupiter has a mass distribution that is strongly concentrated at its core. (See Section D.6.) Incidentally, the measured value of for Jupiter is (Yoder 1995). Hence, . Thus, Jupiter's rotational flattening also satisfies Equation (6.43) fairly accurately, confirming that its response to the centrifugal potential is fluid-like.